You might already know a company named XVIDA, they successfully launched the Boomerang iPad smartcase Kickstarter campaign back in 2012, raising more than $50,000. Well, they’re back with another Kickstarter campaign, but this time announcing a product, or should we say series of products, that promise to improve your wireless charging experience. The core of the system is their existing magnetic locking mechanism found on the Boomerang, but this time they’ve combined it with wireless charging components which they claim is 50% more efficient than standard qi chargers. The magnetic lock allows positioning the phone in the most efficient way, so that the coils are perfectly aligned with the charger. We’ve definitely felt some anxiety with regular pads, you never know if you placed the phone 100% accurately and always wonder if the phone is getting all the juice. This magnetic lock is not only convenient in terms of wireless charging efficiency, but it also makes the mounting system very simple to use. Just a tap is enough to mount your phone either vertically or horizontally. For android devices that support Qi wireless charging, you just need a StickyPad, which is a universal magnetic adaptor that doesn’t interfere with your phone’s wireless charging capacity and makes it compatible with all XVIDA wireless charging accessories. In case you’re a proud owner of an iPhone 6/6S or iPhone 6/6S Plus, you don’t need to wait for the next iPhone 7 to get wireless charging. 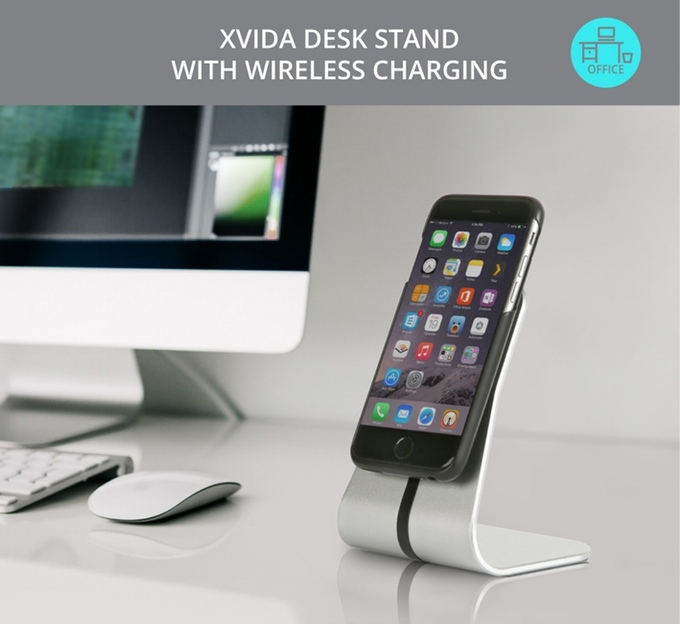 Xvida provides a slim and light charging case for your iPhone that apart from protecting it, it makes it fully compatible with all the existing Qi wireless certified pads on the market. Remember, there are already 160 Million Qi units installed, and you can find them in many places like McDonalds, Marriot hotels, major US airports, The Coffee Bean and Tea Leaf chain stores and are even integrated into IKEA furniture. 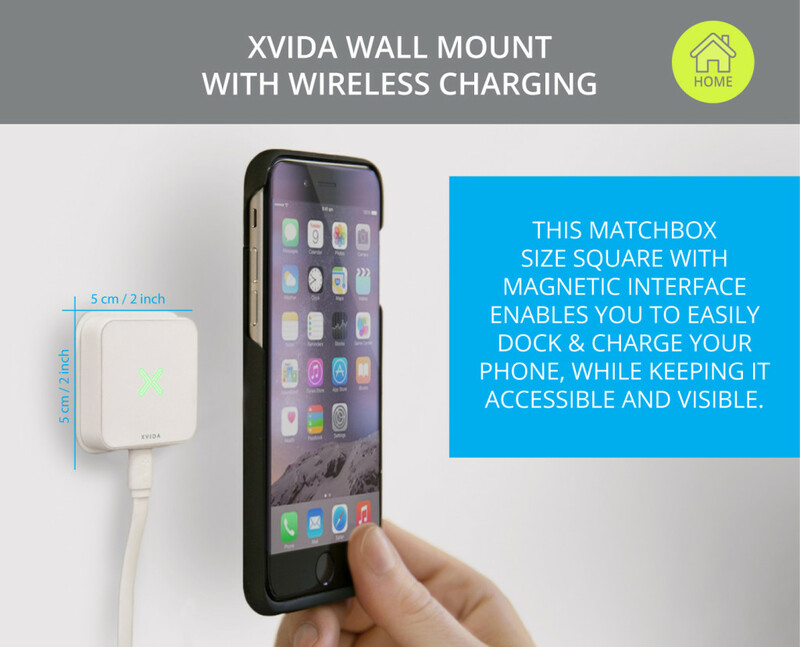 The XVIDA Wall Mount is a small 2 inch square with a magnetic interface that allows you to stick your phone to the wall, but you can still detach it and use the phone while it’s charging, something that it’s impossible to do in most wireless charging devices . For the office XVIDA introduces the neat aluminum made Desk Stand. 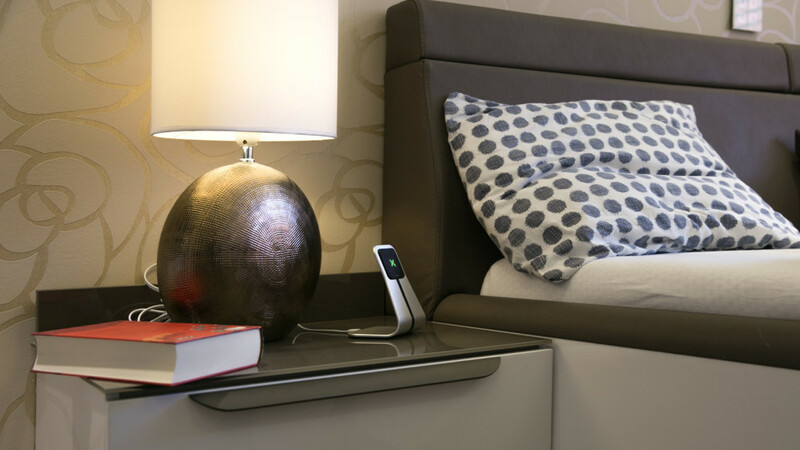 It has a viewing angle of 70º, ON/OFF light indicator and micro suction pads to make it stable. There are three different versions, depending on what configuration you feel more comfortable while driving. There’s an air-vent mount and a suction-cup mount that can be used for the windshield or be mounted on any smooth surface like the dashboard. The Kickstarter campaign started just a few days ago and has almost raised $33,000 of the $35,000 goal. It still has 27 days to go, so we’re pretty certain they are going to succeed as they did with the Boomerang. Unfortunately the early bird reward is already gone, but there are still rewards that are totally worth it (you’ll get 25% off retail price). I’m getting a wall mount for my galaxy s6, are you getting one too? Happy to see at last that someone is using magnets to position the phone, this should be standard. It reminds me of Apple’s MagSafe; it’s those small details that make Apple awesome. Let’s hope next iPhone has indeed wireless charging! Really cool idea. I love the one for the desk. Looks like a solid (non-Kickstarter) product. Nice idea…but what about phones that already support wirless charging? I have a note 5 and I can’t charge and mount my phone (issue mainly in my car), with a magnetic card in my case….will you solve this issue? Does your solution mandate a proprietary case?